In a fundamentally misguided effort to stop Americans from using drugs, the United States Department of Defense has provided over $4 billion in surplus military equipment -- often from warzones overseas -- to local police for free. This equipment, including Mine Resistant Ambush-Protected vehicles (MRAPs), grenades, launchers, and other weapons, is turning America's local police forces into something closer to an army. The so-called War on Drugs has failed to stop drug use, diverted resources from addiction treatment, and had the absurd and dangerous effect of militarizing our law enforcement and our police. Fortunately, Americans are waking up to this new reality, and they are raising their voices online at DontMilitarizeMainStreet.com. 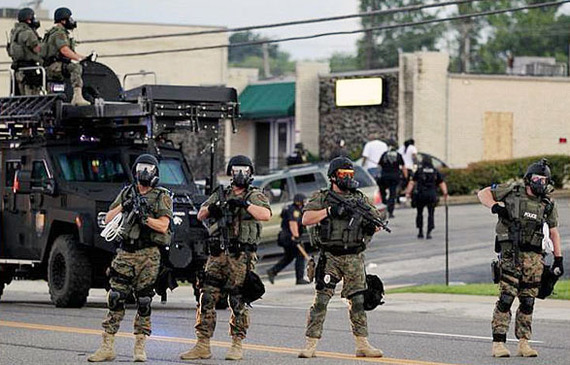 Congress is also considering passage of the Stop Militarizing Law Enforcement Act, which would curtail the types of equipment that local law enforcement agencies can procure from the DOD. In June 1971, President Nixon declared a "War on Drugs." After that declaration, federal drug control agencies' resources and authority were dramatically increased and Congress implemented measures such as mandatory sentencing and no-knock warrants. Then, in 1996, Congress mistakenly gave the Department of Defense expanded authority to provide excess military equipment to law enforcement. Today, the program known as "1033" has provided a large number of small towns with tank-like MRAPs while others have received grenade launchers and high-caliber assault rifles. Even campus police are receiving advanced equipment and weaponry from the program for free. The combination of expanded police authority and expanded access to military-style weapons has created a perfect storm for police violence. This year alone, in Georgia, a baby was badly burned when police dropped a "flash bang" grenade in his crib during an early morning drug raid and a grandfather was killed by police in a commando-style raid on his house in October. Authorities did not make any arrests, nor did they find anything at the house during the raid where the baby was burned. The evidence supporting the raid on the grandfather's house is in question . These are just two instances where the misguided War on Drugs has escalated to horrific levels due to law enforcement militarization. As these stories and countless others indicate, militarization of law enforcement can lead to excessive force during the execution of residential drug raids aimed mostly at street-level, low-volume drug dealers. Furthermore, militarization fails our country by not solving the addiction problem while simultaneously blurring the line between police and military personnel. Our founders opposed using a "standing army" to patrol our streets. In fact, James Madison called this "one of the greatest mischiefs that can possibly happen." Under the "1033" program, however, America's streets are increasingly patrolled by police forces with all the trappings of an army ready for war. Congress must end this unchecked expansion of military weapons into our civilian law enforcement agencies by passing the Stop Militarizing Law Enforcement Act.